Confessions of a Dressage Barbie: Start, Then Stop. Rinse. Repeat. Since my ride-tracking notebook is still MIA (that's what I get for ordering something off Wish), you're getting another mind-numbingly dull ride recap so I can keep up with my goal of tracking all my 2018 work sessions. Wednesday was a bit of a throw-back to last weekend in terms of weather, with high 50s and sun. 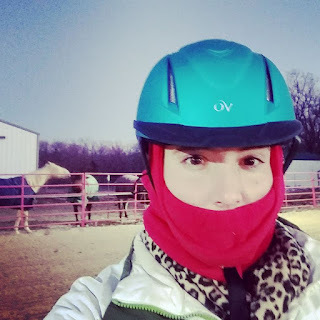 I had been keeping an eye on the forecast all week, so I knew that was my best bet for a productive ride – I can ride when it’s 30 (or even 25), but it’s more fun and I get more work done when its warmer! Throwback to that time 25 felt like a heat wave so I saddled up. I zipped home after work and immediately set to work getting some outside stuff done while I had daylight – I let the chickens out for some supervised free ranging before the sun set. The neighbor’s dogs were in the pasture adjoining the goat pen, so they were pretty worked up. I spent some time chasing the dog away and tossing some hay so the goats could focus on something besides BIG SCARY DOG. The dogs also had the horses pretty lit up, and there were some impressive gymnastics going on. Ruby brought her A game to the ride, although by the end our lack of fitness was working against us. After a long warm up (during with she suspiciously peered at the goats who revived their game of king of the shed), we started working on transitions and accuracy at the walk and trot. 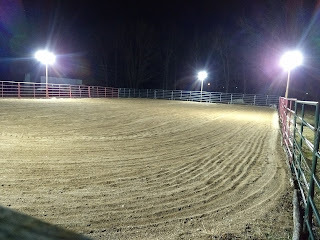 I would pick a set point (usually a light pole or a particular panel of the arena, since I don’t have my dressage letters out), and do an upward or downward transition. Real bored with between the ears shots but they're 80% of what I have, sorry! 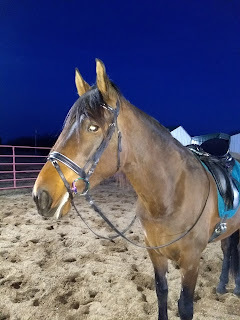 Once she felt nice and sharp off the aids, I worked a few walk to canter transitions starting in the corner, cantering 10 strides down the long side, downward transition to five strides of trot, and then walk. I found counting out loud really helped keep me focused about asking for the transitions at the right moment – one of those times it’s nice to ride alone, so no one thinks I’m a kook talking to myself, lol. I revisited our trotting figure-eight across the short side from last time, and also worked on leg yielding off the rail to the quarterline, and then riding quarterlines for a while. Lipstick and light sweat -- I'll take it! Our last exercise before we both kind of pooped out from lack of fitness was to make a few attempts at cantering up the quarterline. Ruby found this super easy tracking left (unsurprising, that's her "good" direction), but tracking right I had some trouble keeping the momentum balanced through the tighter turn. She broke gait the first time we tried, and then we had some trouble picking up the right lead canter again. We did finally manage to get it without zooming or motorcycling, so I called it quits. I was really feeling my lack of saddle time lately, particularly in my legs! DH dragged the arena when I was untacking, so it's ready for the weekend! I let her stretch out and cool down on a loose rein while I answered some emails (multi-tasking at it’s finest, haha). After untacking and consulting my weather app for blanketing purposes, I tossed her back out to finish her hay. 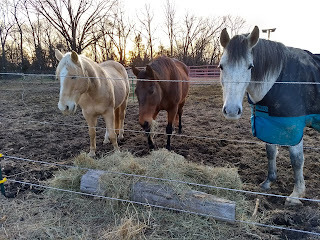 I considered pulling Cinna in for a quick lunge, but the temps were dropping and I was getting hungry, so I opted to go inside for dinner instead. Thursday the weather took a turn for the gross (aka freezing) again, and today isn’t much better. 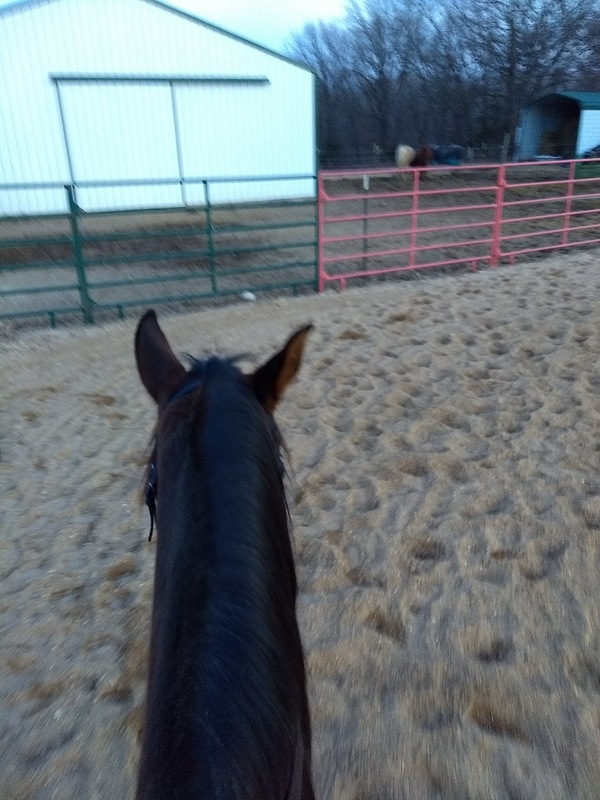 At least we have inconsistent warm days scattered throughout so I can feel like I’m making some progress with the horses, no matter how slow! 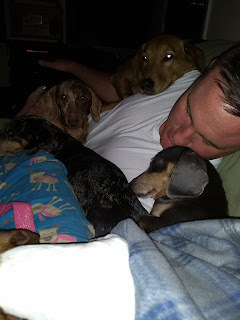 Although once it's warm out consistently I'll miss my evenings snuggled on the couch with this motley crew! 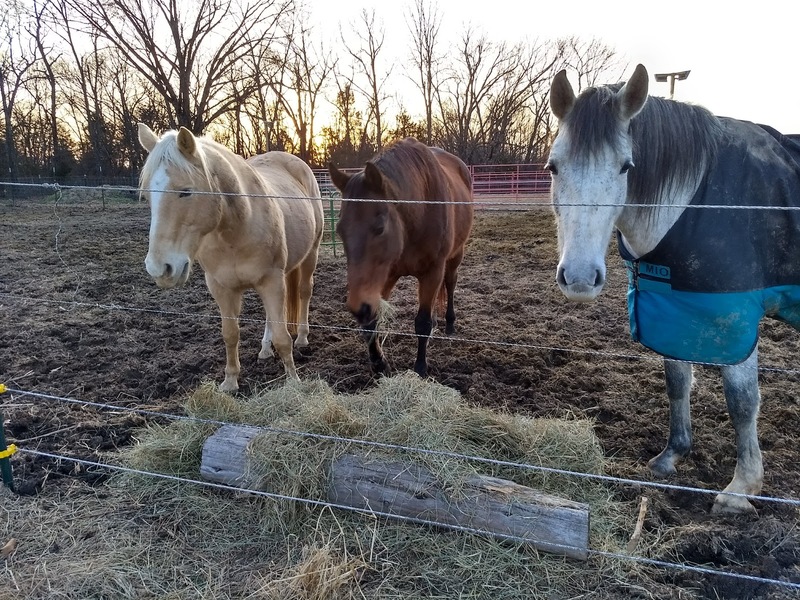 Once it gets consistently nice I’d like to alternate riding the girls on weekdays, and then try to ride them both on the weekends – that would give them a solid 4-5 days of work each week, weather permitting. We all know how good I am at keeping to goals (hahahaha), but if I put it out in the universe, at least I can half-heartedly work towards it? Yay for more riding! It keeps snowing here. Not significant amounts, but enough to have snow all over my ring. Stupid. I keep telling myself that once or twice a week is better than nothing? Maybe? Haha. Bring on spring! Ugh this weather - 50's sounds amazing, though! I'm stuck at once a week right now, though I am scheming to get over to the indoor this weekend. I am finding myself dreaming of mud season... at least mud isn't rock hard and so slippery I can't even. It's impossible to be on any sort of schedule so good for you to keep at it. Yeah, I'm just consoling myself with riding when I can and trying not to sweat the days I can't. That's life! Counting outloud definitely helps! I can't tell you how many times when I got personal training that I lose count of the reps because I wasn't counting outloud (slash I thought that was the personal trainers job...) Be the kooK! Transitions forever! Omg, how many weiner dogs do you have?! So manyyyyyy. So cute. 😂😂😂 we have four right now (we had five a few years ago but lost one to an incurable spinal condition). They're so sassy and funny, I adore them. Omg yasss my goal is so much riding today. The image of the goats playing King of the Shed had my cracking up. My incessant toodling has done wonders for my confidence but yeah, nada for the ol' legs. You're welcome? Not entirely sure what you're thanking me for.